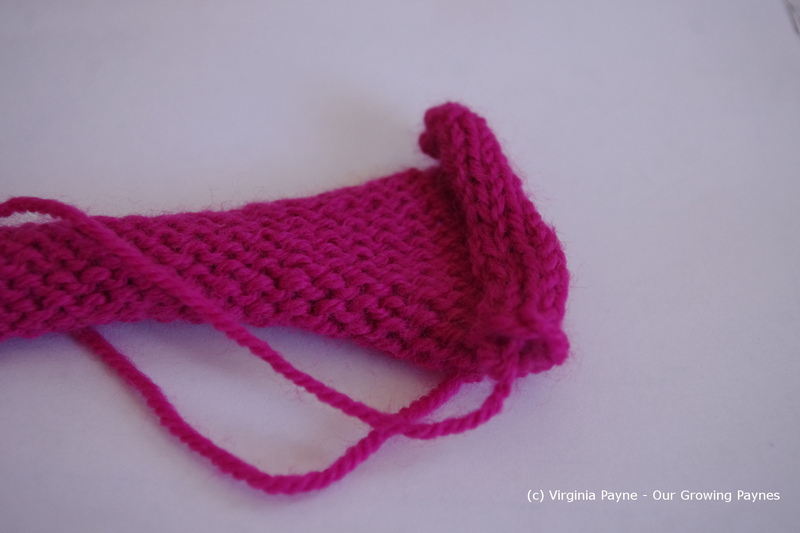 For those of you who follow my blog know that I enjoy knitting albeit slowly. My mother in law is a fellow knitter but can take it one step further by spinning her yarn. They used to have sheep when they lived stateside so she learned how to spin. It’s something I have been curious about but viewed it as something intimidating. The kids and I had a lesson from her and the technique isn’t difficult but it will take practice to get it down. It’s a bit like rubbing your stomach and patting your head at the same time. And you have to get the treadle timing right or you will reverse the wheel! My MIL knows how to do all the steps including carding but she also gets what you call roving. The wool has been prepped for spinning. As it is spun it will collect on the large bobbin. Because it is impractical to spin everything all at once and there are times where the end you are spinning will get sucked through and onto the bobbin a hook is used to thread it back out. The technique itself is easy but it’s difficult to get the feel for it where the yarn is spun evenly. When I was doing it parts of it were chunky and parts got quite thin. Once you get the wheel spinning the left hand pinches the wool at the top and the right hand pulls the wool out. Release the left hand and the wool will spin down to the right hand. This a continuous movement while treadling. 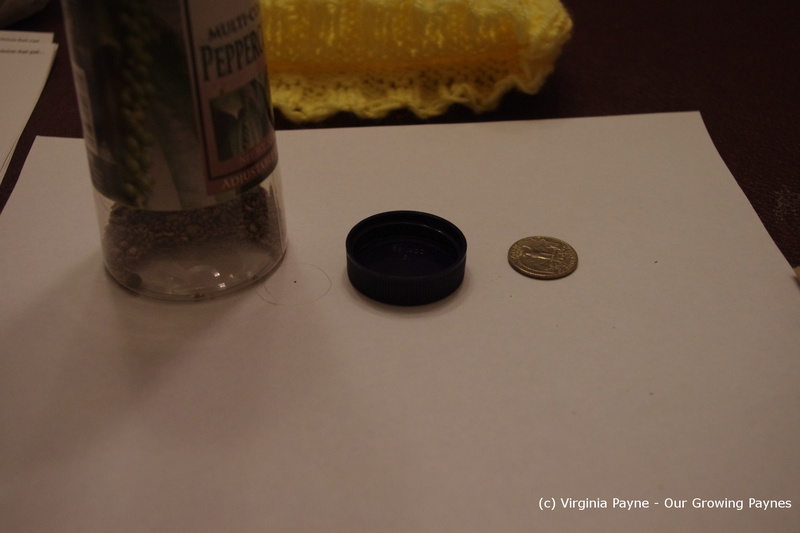 Once you fill the bobbin another needs to be filled. Then you spin both together for a double knit. Otherwise the yarn will curl up on itself. I have to say I really enjoyed this. It’s hard not to think of all the possibility with dying the wool! We’ll be seeing my in-laws this summer and I wanted to knit something for my MIL. We enjoyed looking at patterns and getting yarn in the past together and I wanted to do a quick project. Because they have a B & B she uses tea cosies so I looked for a pattern. I wanted to do a sheep theme as she has a few sheep themed items. I couldn’t find a good one! Well I found one that was a pasture scene on Ravelry which was pretty but all that was posted was a picture. No pattern. So I went in a different direction as I’m not quite at a place where I could come up with my own pattern. 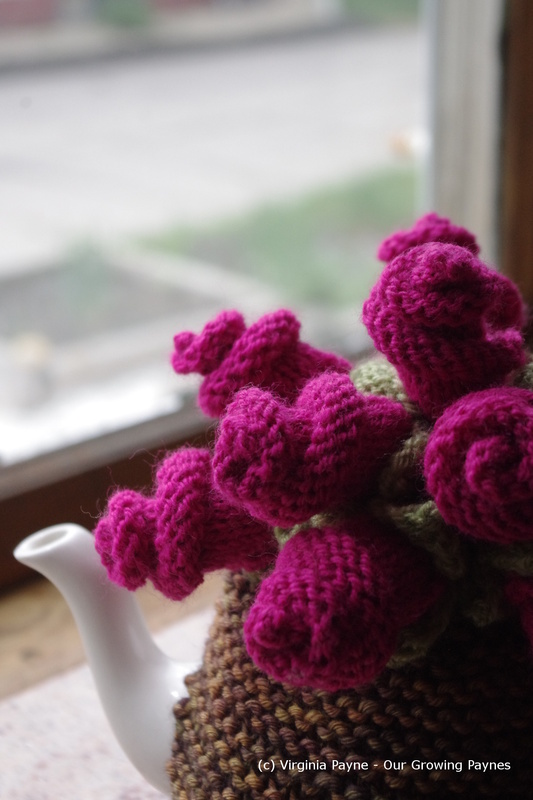 I found this pattern for Chamomile Flower cosy. I found some gorgeous burgundy wool as I really don’t like beige or colours close to beige. Think that comes from living in a flat that was all beige. Blah. 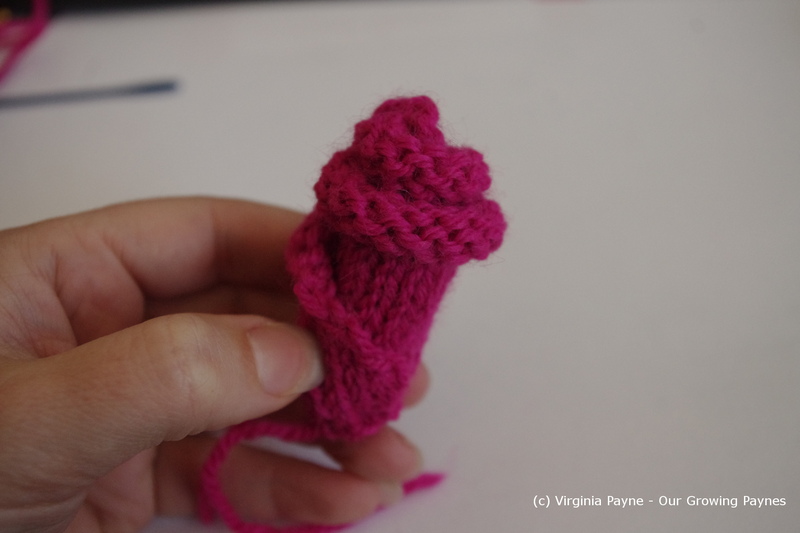 The components are very easy to knit. I did have a thought that the main bit of the tea cosy would make a great hat as well but that’s for another day! The flowers were a little tricky putting together in a way that the petals look natural. I felt like I had butter fingers trying to get them go into circles. After they are shaped add the yellow pieces. The pattern calls for six leaves but because of the way I placed the flowers I knitted seven leaves so it looked balanced. Today will be a cosy PJ day with the kids. Our son had a sleepover with a friend last night so it was a bit loud until they crashed. So today will be a day of playing Dr Who games with no place to go. Though tonight my husband and I will have a quick date night as it is the anniversary of us meeting six years ago. On our first date he brought me Marmite. I was hooked. I thought this guy is going to understand me. I was so right! When I think of my family I sometimes feel as though I have to pinch myself. It’s unreal how lucky I got. We have two amazing kids that are healthy and bright. And they are developing the twisted sense of humour we so much enjoy. It’s funny when they suddenly understand us because we’ll be saying something and out of the blue there will be a snicker. Welcome to our world. 🙂 And I have a husband that makes me laugh every day no matter how crazy the world is. And the world is often off it’s rocker. Over the years I’ve made gifts for various family members and this year it was my sister’s turn. 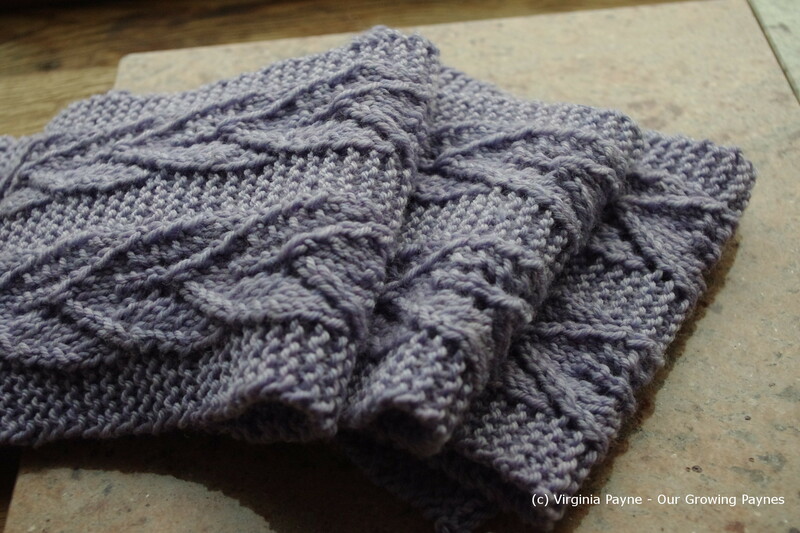 I’ve mentioned in a previous post on the wrist gauntlets that I bought the book 60 Quick Knits that uses cascade 220. 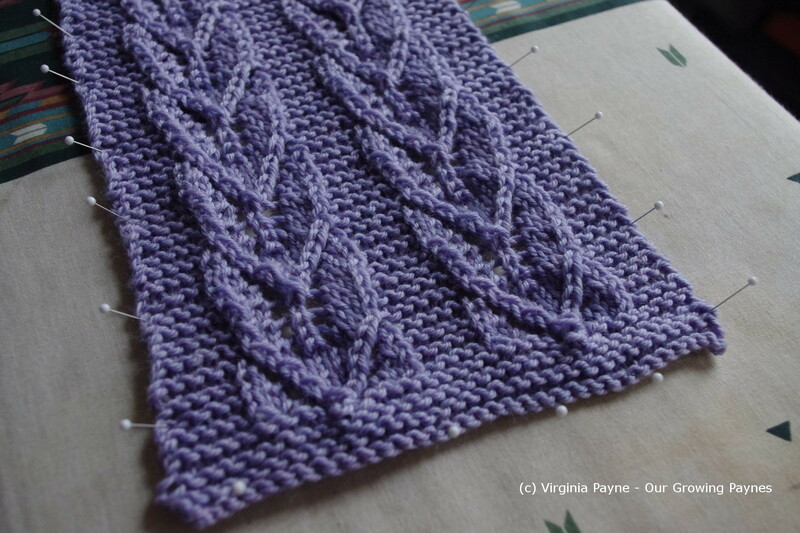 I found a gorgeous scarf in the book that has raised leaves as the pattern. I found a soft purple that would be perfect for her. She looks great in these tones. It wasn’t a difficult pattern but it took me awhile because of the length and plus I was doing other projects as well. I sometimes wonder if all this multi-tasking is efficient! Once it was done I needed to block it. 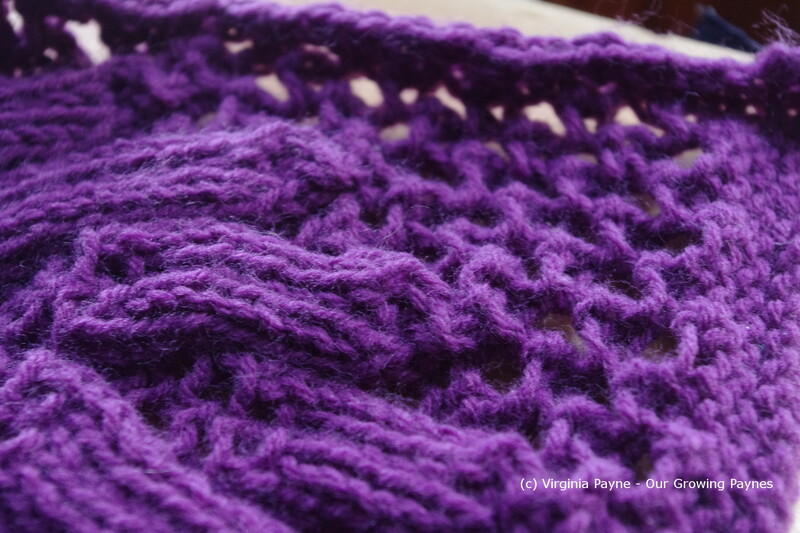 Something I haven’t done before but I chose a simple method of steam as it was a basic scarf not a complicated shape. I had to do this in two steps as the scarf was longer than the ironing board. 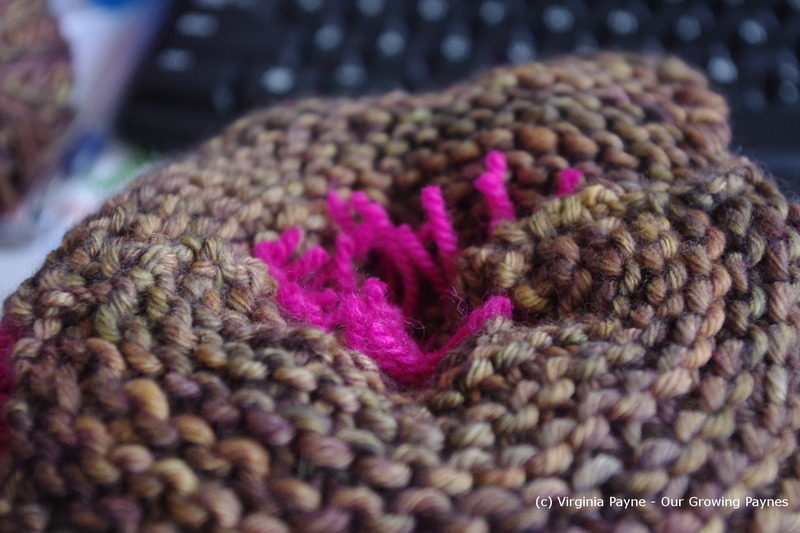 To do it, use pins to shape the scarf. Next use a very hot steamy iron and bring it close to the yarn without touching. It’s a little tricky as steam likes to rise but get the yarn nice and damp. Leave it to dry and it will be shaped and blocked. I really liked the delicate leaf pattern with a bit of a lace effect. I’m pleased to say my sister really liked the scarf. 🙂 Now it’s time to figure out Dr Who Yatzee and Dr Who role playing game. Get your geek on! Sometimes I’m envious of babies. They get to wear the softest things. All the soft blankets, clothes, toys. Well I don’t need the toys but still. I like soft fabrics and yarn! Our kids are obviously out of the baby stage and so are most of our friend’s kids as well. But good friends of ours just had a gorgeous little girl and as I’ve been back into knitting this year I thought I’d knit up a few things. So off I went to Ravelry and did a search for something practical but pretty. I came across a pattern they were referencing as a drop design. A little hat and blanket. I thought this would be perfect. Off I went to choose colours. I don’t like to do the typical colours of pink for girls and blue for boys. It’s so overdone. I picked a lemon yellow for the hat and a coral orange for the blanket. The pattern for the blanket said it needed 450g of yarn. I found that to be way too much. I only needed to buy 300g worth and had some left over. I did wander from the pattern in that I decided not to crochet round the edge and I knitted the whole blanket at once. 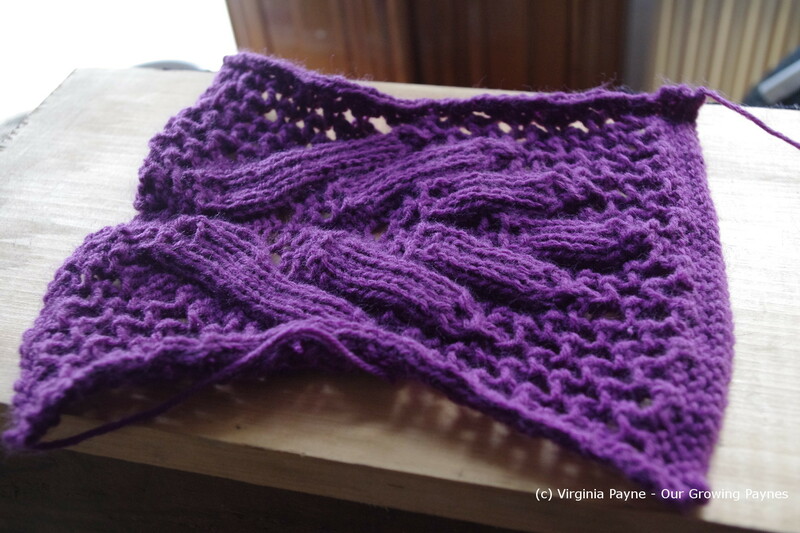 The pattern calls for knitting 12 rectangles then sewing them together. The blanket took me a few months what with traveling and all. The tricky bit at the end was getting all the dog hair off of it. With two dogs that like to cuddle it’s impossible to keep it off whatever project I’m working on. I must have blinked and missed this week! It has flown by and I’ve hadn’t had much of a chance to check out blogs let alone write one. Just one of those weeks that is crazy busy. I had to wear several hats at once so to speak. Today is a gorgeous day and will be like this all weekend so gardening is on the list. Actually it’s at the top of the list. Winter is coming! Not only to we have to put the garden to bed I need to prep for the coming cold. I picked out a few knitting patterns to help me out. 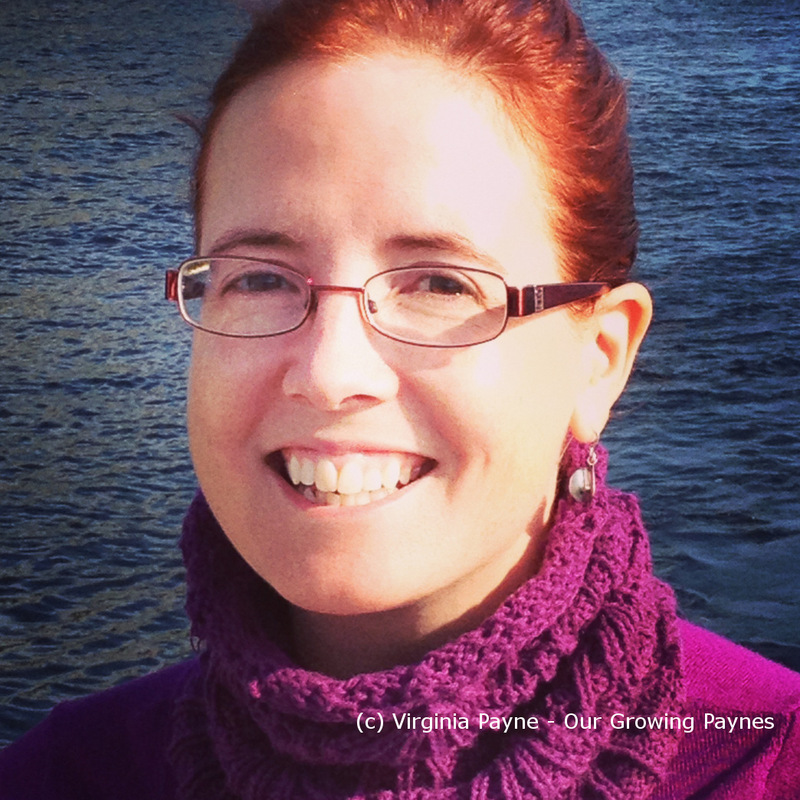 I did the cowl this summer and it has proved to be a great choice. It keeps my neck nice and toasty. There has been a big trend towards wrist warmers or gauntlets lately. I usually avoid most trends as they go out of style but this seemed really practical. Our house is usually kept around 55F/13C because oil isn’t cheap! I start to look like a oompa loompa with all the layers I put on. I found the pattern in a book called “60 Quick Knits” that calls for the type of yarn Cascade 220. 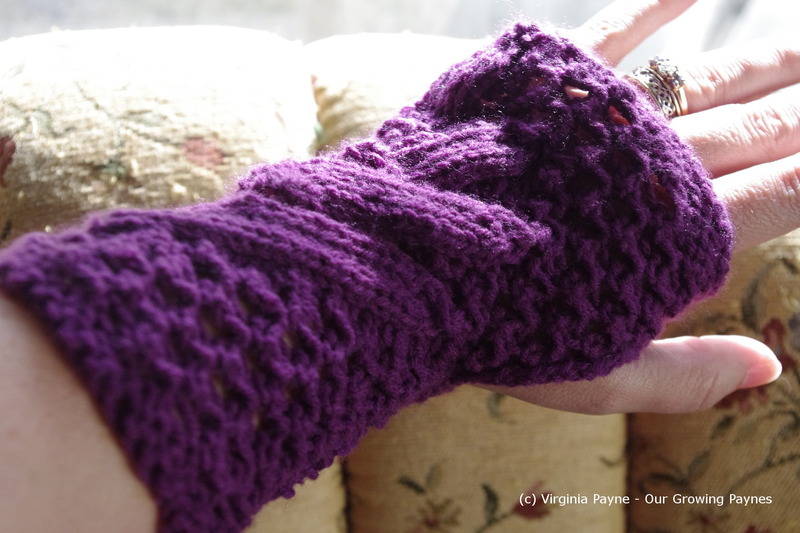 The pattern is called Leaf-Lace Gauntlets. Again it was a chart pattern so I had to pay attention but overall I was able to complete them in a couple of weeks. There was a lot of lace work in this pattern and the chart was based on working the work side rather than the right side so it took awhile to make sense to me. 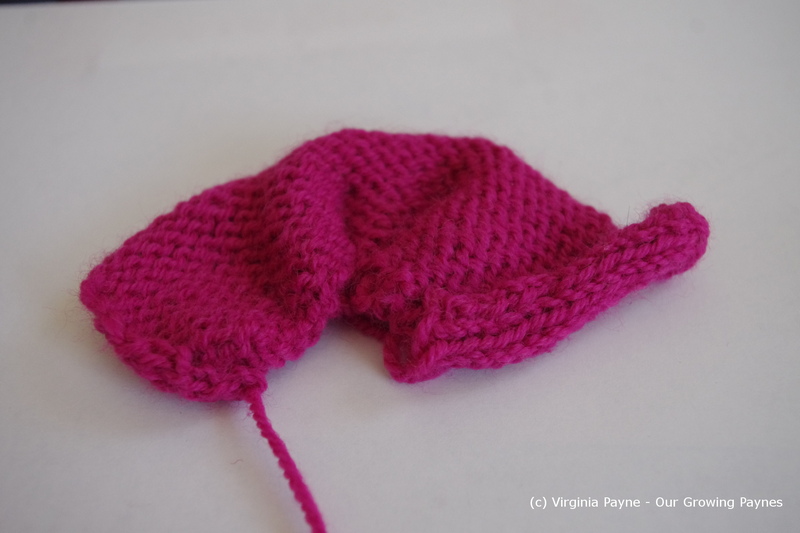 Once I had both pieces knitted then it was quite easy to sew the seams leaving a hole for the thumbs. Genetics are a funny thing. My Grammy would get a cold almost instantly if her neck got cold. I was unable to escape that fate. Even on a lovely spring day hiking along a coast if the wind is too much on my neck I get sick. Last year in Dorset I was hot as can be in my turtleneck traipsing about so I thought this was nuts. I needed a solution. Poking around the Ravelry site I found it. Cowls! I can wear light shirts but keep my neck protected and hopefully look somewhat fashionable. It had to be better than the turtleneck! 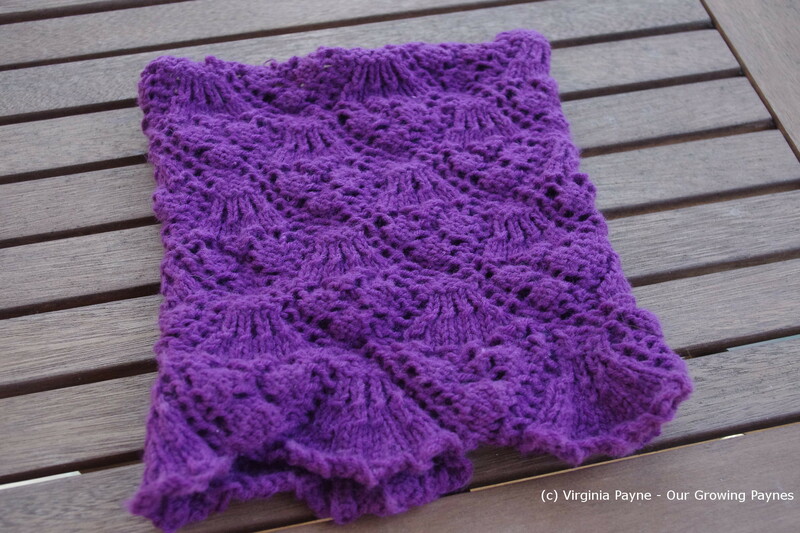 The pattern I decided on was this cowl. Then I had to figure out how to follow it as it is charted. But I loved the pattern so I gave it a go. It took me a couple of weeks, which for me, is super fast. 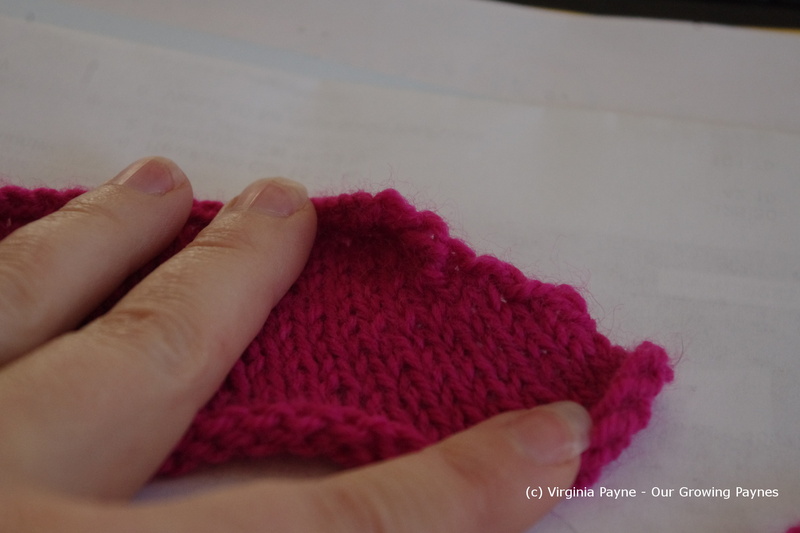 🙂 I did it in the round and the only note I would mention is cast on 131 stitches, not 130, as you slip a stitch over to join the two ends of the round at the beginning. Unfortunately I figured that out after doing a row or two. My mum loves a good cuppa so I wanted to make a fun tea cosy for her. 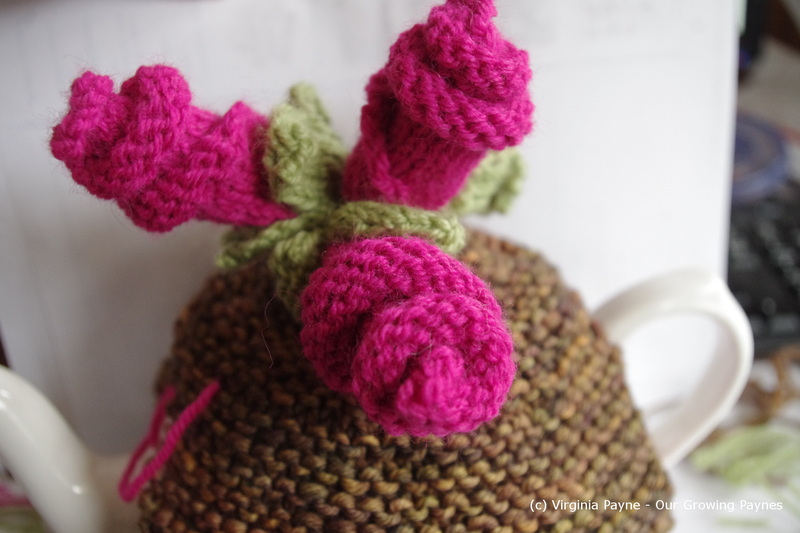 I found this Rosebud Tea Cosy on Ravelry and thought she would love it. 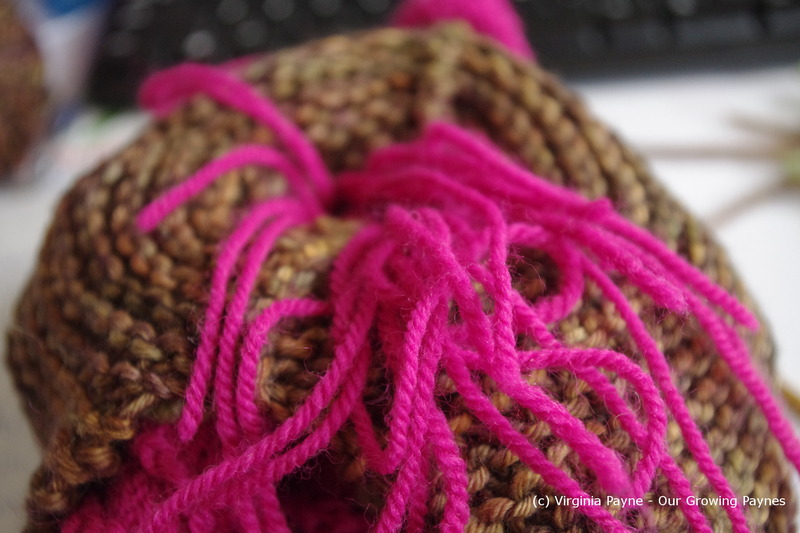 Instead of a verigated pink and green yarn I choose a lovely brown that made it look like a woven basket. According to the pattern this will fit a 6 cup teapot. For the basket I got 50gs of the brown, 100g for the pink and 50g for the green. I did have yarn left over. So I need to find another project! Next Row (K1, K2 tog) to last stitch, K1 which leaves you 9 stitches. Thread the yarn through, pull tight and fasten off. 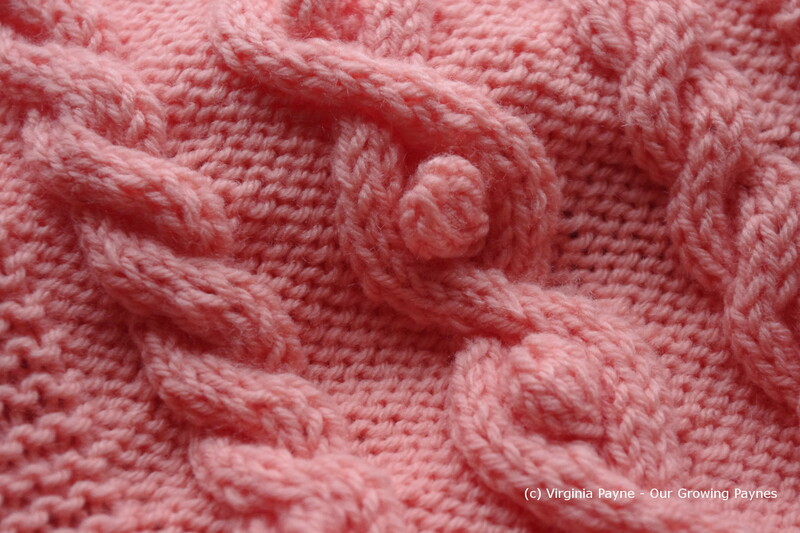 The next bit is to knit the rosebuds. Her directions said to knit 15, which I did, but I only ended up using 14 once I put them on the cosy as I wanted it look balanced. Normally an odd number does make it look balanced but I couldn’t get it to do that without it looking a bit lopsided so I went with an even number. 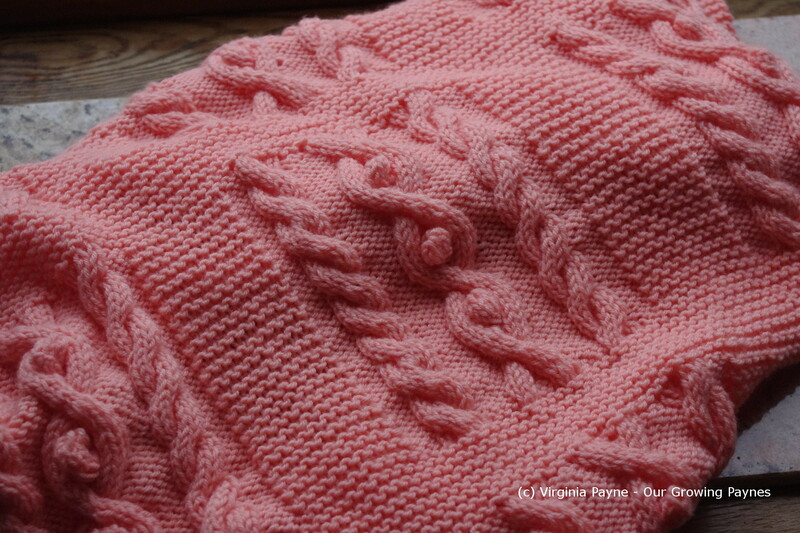 Use 4mm needles and the rose yarn. The pattern said to use st st throughout K2 rows. Wasn’t sure if she meant 12 so I tried that and it was too long so I went with 6 rows. A little long but looked better. She may have meant 2 rows. Once you have the rows it is time to decrease. Decrease at the beginning of the row and every knit row for 10 rows. She suggested Sl1K1PO to decrease and that worked really well. Then cast off. 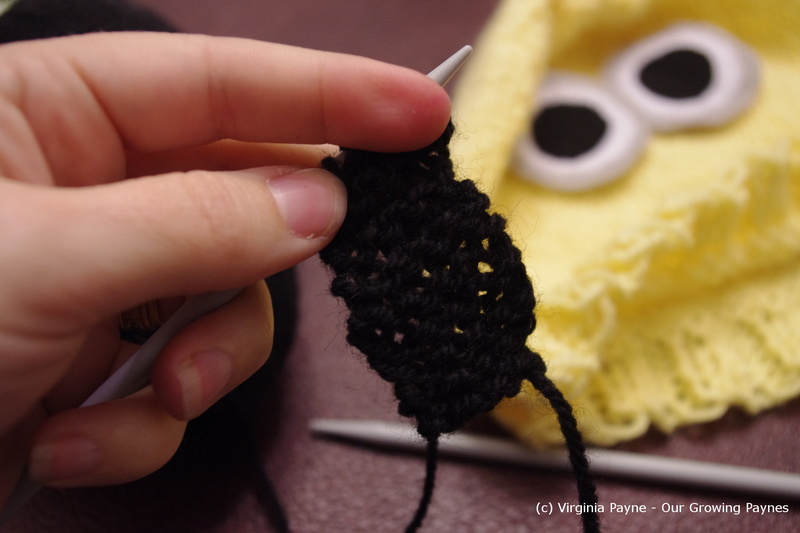 You want to leave a long piece of yarn at the end for finishing later. 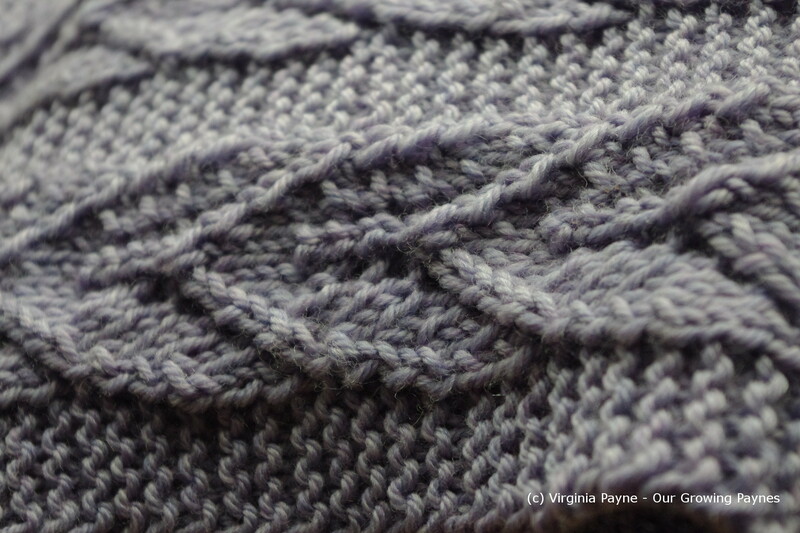 I really deviated on the leaves which is the final component to knit. Her directions had you knitting 21 stitches but somehow doubling back and then knitting one leaf at a time. For the life of me I couldn’t figure that out. I was flummoxed! 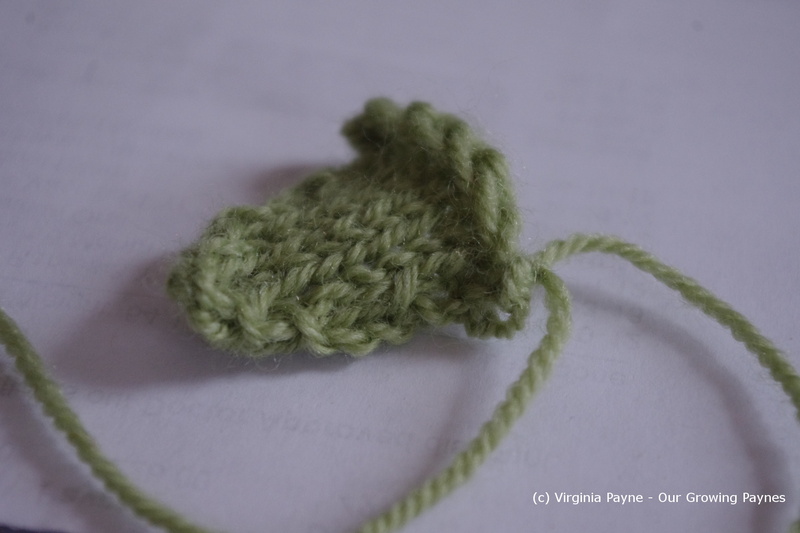 So I did each leaf separately and knitted 30 leaves. I cast on 7 stitches using the 4mm needles and knit one row. 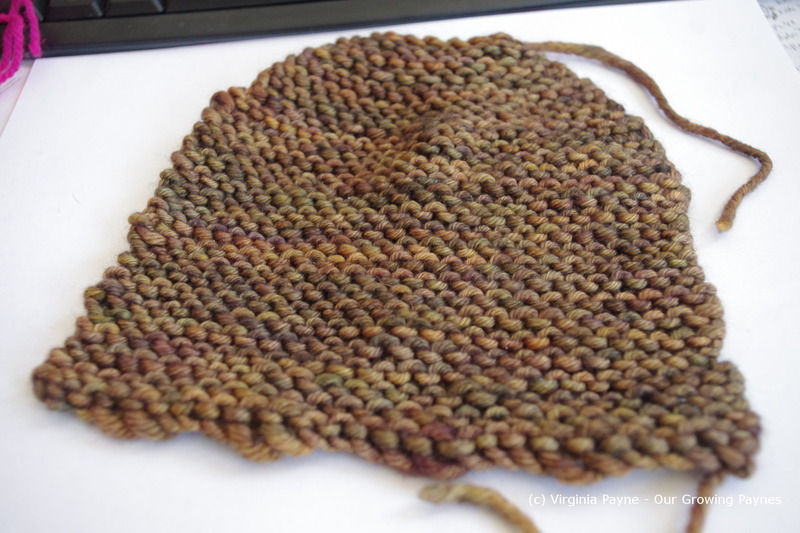 Then for the next 5 rows I st st.
To make the leaves an even triangle I decreased at each row until you are left with 2 stitches and then P tog and cast off. It was now time to put it all together. First the basket had to be sewed together. 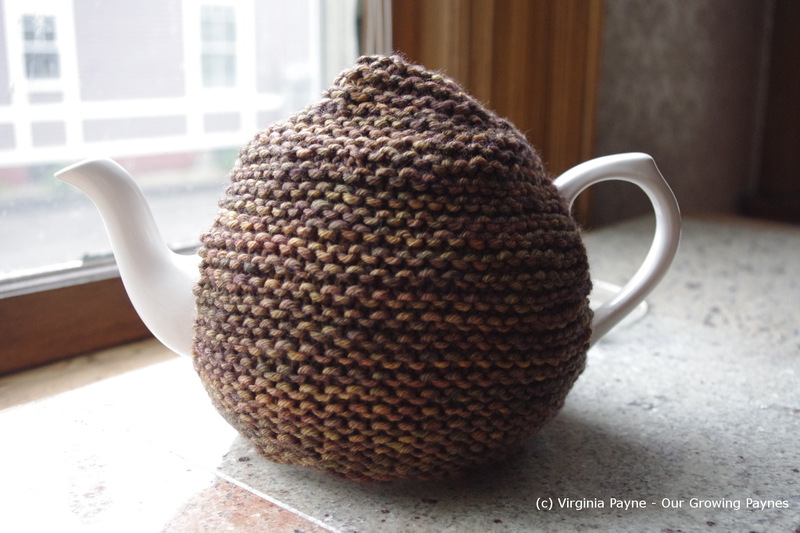 It is a good idea to use a teapot to figure out the openings on each side. Per her instructions I sewed an inch on the bottom on each side. Then I sewed the top seams together leaving an opening to match the spout and the handle. Once that is done it is time to work on the roses. I pretty much followed her directions at this point as it worked well for me. Place the rose piece flat on the surface with the long length towards you. On the straight edge roll it a couple of times towards the angled side. Then stitch halfway up and back down again to hold it into place. Next do a gathering stitch and pull in a bit. Continue to roll the rest of the way. Sew round the bottom to secure the rose. Once all the roses are done I connect the leaves in groups of threes. I attached them at the corners and used a gathering stitch to pull them in a bit so it would curve round the roses. Place round the rose then sew halfway up the leaves attaching them to the rose. Now it is time to attach the flowers to the basket. 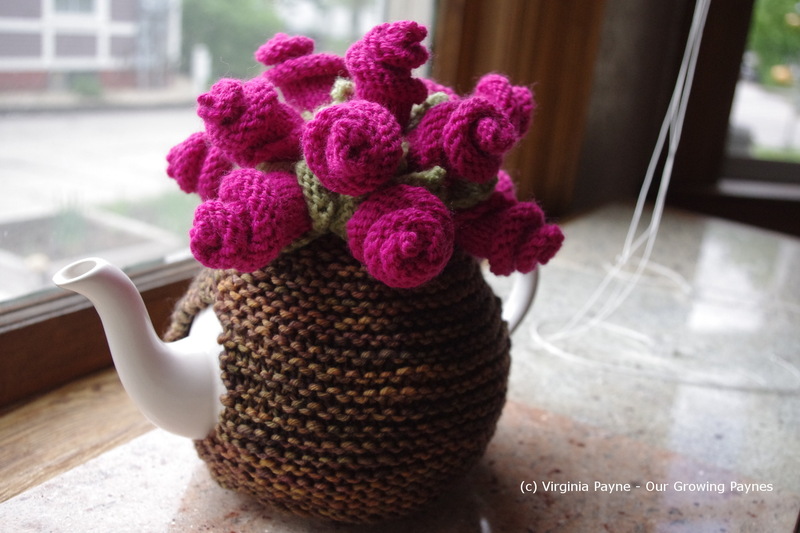 Per her tip I placed the basket over a teapot and it does help figure out the placement of the roses. I followed the directions of taking 3 roses with leaves and placing them near the top and adding a filler rose without leaves in the centre of that. Then I placed the rest of them round the cosy. To attach I used a crochet hook to pull the pink threads through the basket. I had tied off the green threads and trimmed otherwise you would have a ton of yarn to deal with on the inside of the cosy! 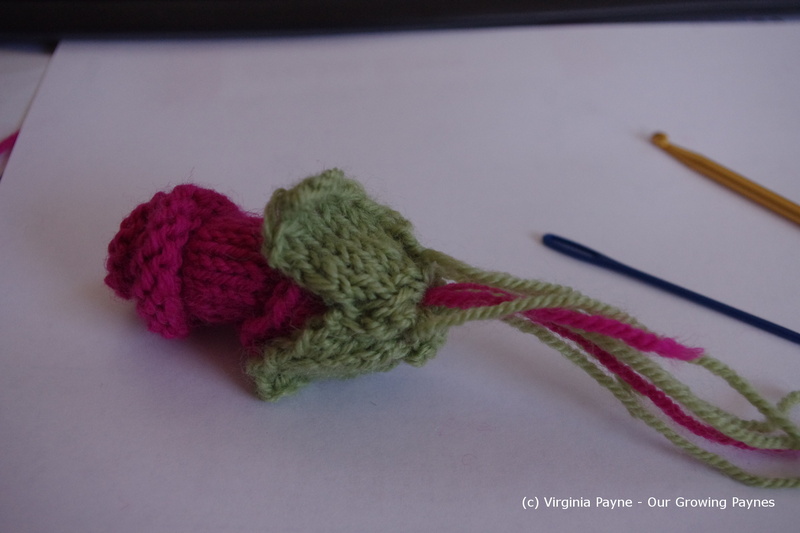 I then weaved the yarn into the surrounding roses to pull the bouquet together so it wouldn’t be floppy. 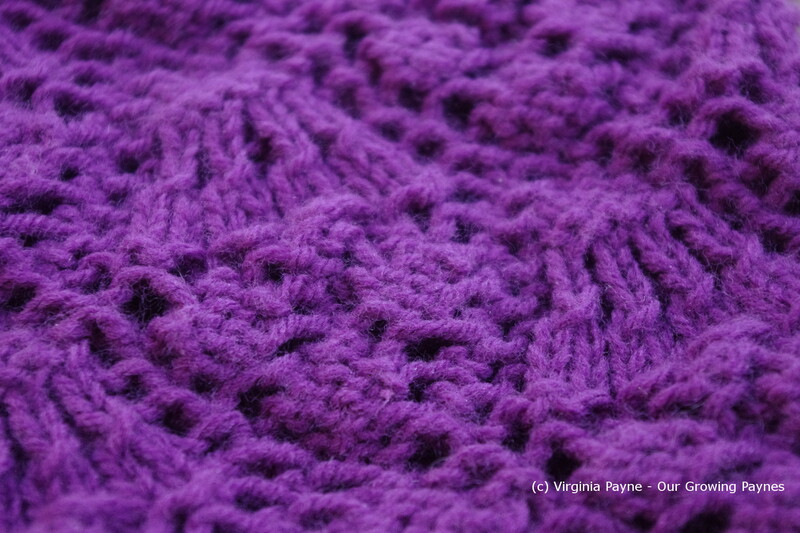 Pull the yarn through to the underside of the cosy. Next I needed to tie off all that yarn. So I separated the pairs and tied the yarn off with different pairs then trimmed the yarn. It wasn’t an overly difficult project just time consuming as I have so much going on. 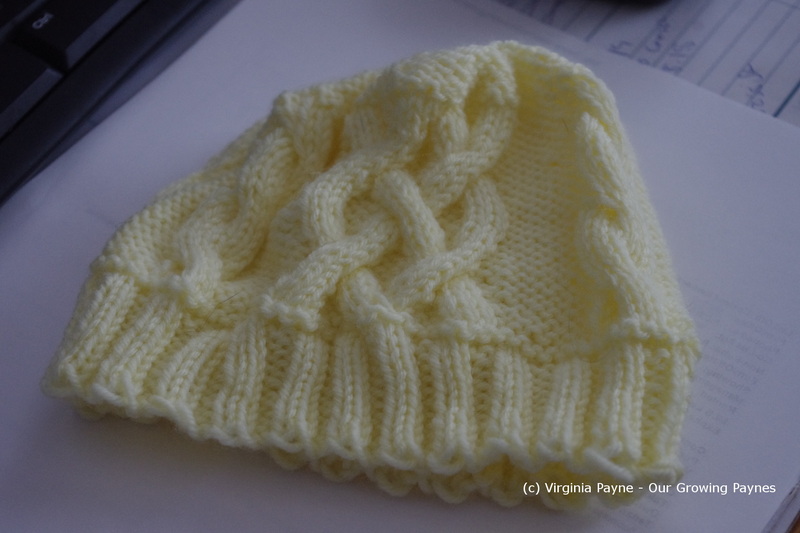 I will be looking at her other cosies to try out as this came out pretty well. 🙂 And mum liked it! As I found I didn’t have time to knit 3 dolls like Young Elsie I wanted to find something creative for my kids. I decided to try my hand at hats. 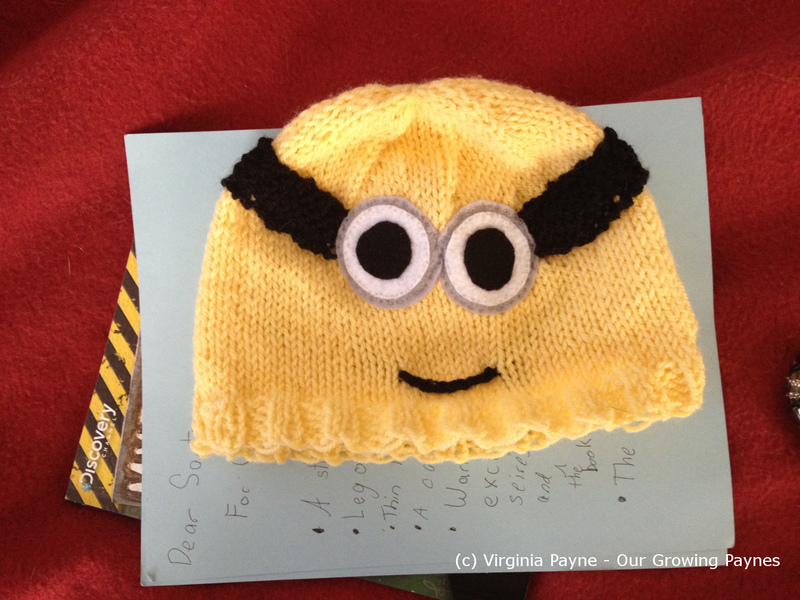 My son loves the movie Despicable Me so I went onto Ravelry.com and found a pattern for the minions. 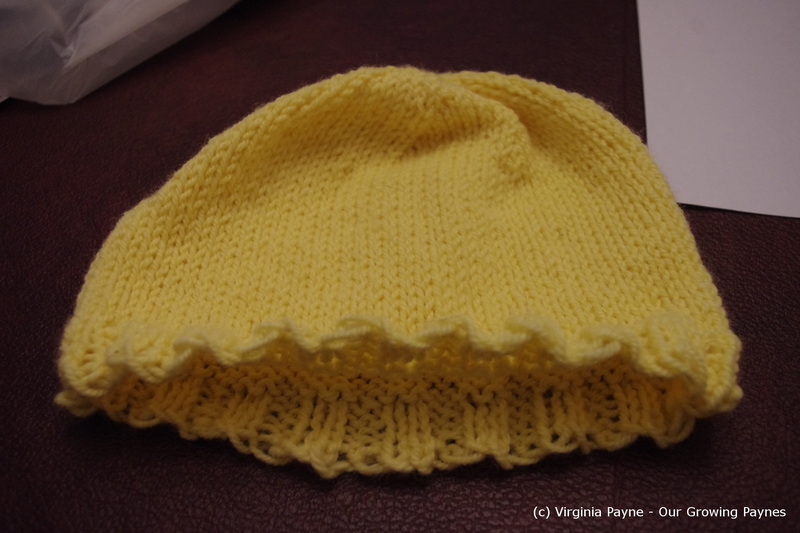 It looked relatively easy which was good as I’d never knitted a hat before. 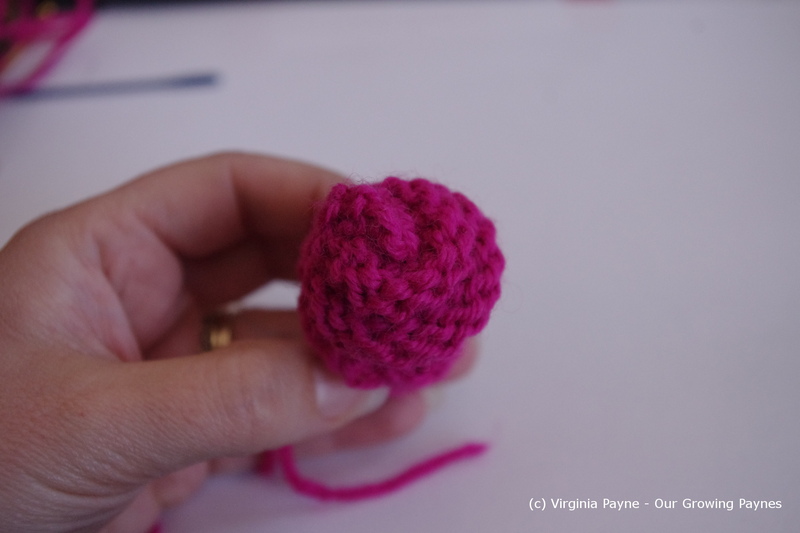 As I’ve forgotten how to crochet and have never done it in the round before here is how I got round that bit. After I knit the hat I had to come up with a cunning plan. 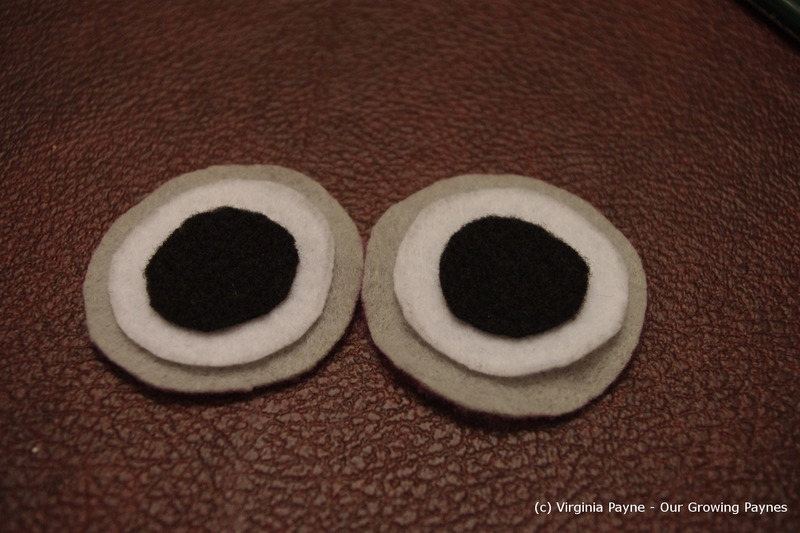 (Yes, I watched Blackadder last night but my plan actually worked) I bought bits of felt for the goggle eyes. 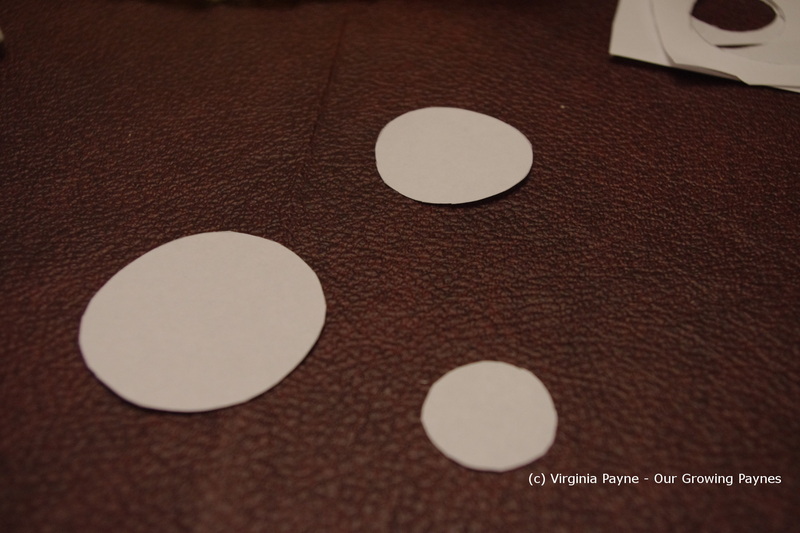 I didn’t have any patterns to cut out so I used household items to get the size right and cut it out of paper. 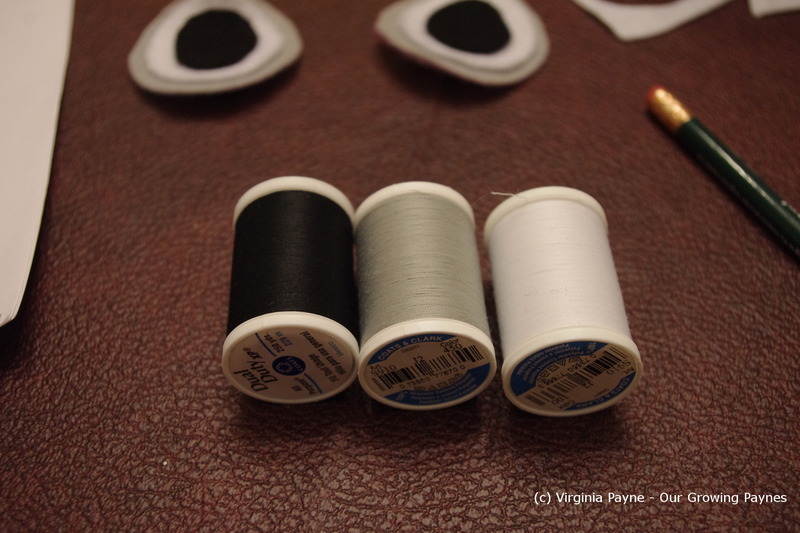 Using matching thread you want to sew the black to the white, white to the grey. For the band, I tried crocheting and I am just so out of practice I decided to garter stitch until I got the length right. I used 5mm needles and cast on 5 stitches. I did however manage to single crochet the mouth! Small victories. 🙂 Sew it all onto the hat to complete.